When it comes to packing, I have a love relationship with packing cubes. I will never again pack my luggage without using packing cubes. They are the best thing that has ever happened to packing. 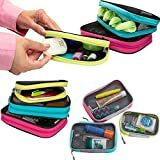 Being a frequent traveler who has to pack and unpack luggage nearly every week, it is a true lifesaver to have them, because they are the best luggage organizer you’ll find anywhere. If you’re not already using packing cubes, you need to get some ASAP. I promise you’ll never go back. No matter which type of luggage you prefer to use (suitcase or backpack), you’ll benefit greatly from using packing cubes. Not only do they provide separation for your clothes (such as mine in these, his in those; or shirts in here, underwear in there), they also compress the clothes so you can fit so much more in. I know that I will never pack again without these packing cubes. AmazonBasics packing cube set for as low as $13. For the price of one airport lunch, you can organize your luggage forever. Definitely worth it! In case you don’t have a lot of time to read through the reviews below of each of these packing cube sets, below is a chart with our top packing cube sets. No matter which set you go with, these are all top-quality and well-used and loved by travelers. They receive high reviews for a reason. They provide organization for your clothes and other items. They compress clothing so you can fit more in. They keep your clothing from getting wrinkled. When the TSA agent opens your bag and rifles around in it, your underwear won’t fall out on the floor for everyone to see. If you take 2 cubes and you have a place to put your dirty clothes, separate from your clean ones. When traveling with a partner, you can keep your clothing separate easily. When you arrive at the hotel, you can take the cube out of your bag and put it directly into the drawer. There are shoes cubes to keep your dirty shoes off your clean clothes. Packing cubes come in various sizes and shapes. The best way to use them is to buy complimentary sizes to fit your needs. You can buy the cubes that will fit into a nice Tetrus pattern in your suitcase, or you can buy two large cubes to put together in a travel backpack. I tend to use the large size for all of my shirts and pants, and the small size for my socks and underthings. If I’m only taking a backpack, I might use two mediums instead, because they fit better in the backpack. The best packing cubes are about 3 inches deep, are made of stretchable mesh material, and have a sturdy zipper around the top. Fit your clothes into the space and zip the top around them. That’s all there is to it. You can stack clothes, as normal, or roll them up individually. I haven’t really found that rolling helps save additional space, but it does keep everything ultra organized. The best part of these packing cubes is their ability to stretch. This is why it’s important to buy quality packing cubes, because they need to hold up to excessive stretching when you have just one more pair of jeans you need to fit in. I’ve been able to stretch to the max to fit a few extra things. Never has a zipper broken or the seams ripped. eBags Packing Cubes. The eBags are still my favorite. They are incredibly durable and flexible, and they compress everything down so well. But I now have multiple different sets of packing cubes from various brands, and they all work very well. For me, the best place to buy packing cubes will always be on Amazon, especially with Prime shipping. You’ll get them quickly and you can return them if they don’t suit you (though I don’t see that happening). You can find them also at Target, Walmart, REI, etc. My obsession with eBags began almost 8 years ago now. The first time I bought a set of eBags packing cubes, I was instantly hooked. I love how flexible they are. The material is a breathable nylon fabric that is stretchy, but durable, and very lightweight. The bag has a mesh top that doesn’t trap in odors when packing dirty clothes. The zippers are premium YKK reinforced zippers that are very strong. I can pull on them as much as I want to get the bag closed and they never feel as if they’re going to break or bend. You can pack quite a bit into each one – they are 3 inches deep, so a pile of 6 or 7 shirts stacked up inside isn’t too much for it. Best of all, they are guaranteed for life. You will never need to buy another packing cube, unless you lose it or set it on fire. Pack-it-Flat Toiletry bag that we now keep packed up and ready to go with our travel toiletries, so all we have to do is grab it and go. The second best travel packing cubes would be the Eagle Creek Packing Cubes. They use a different, thicker material than the eBags, which is really the only big difference between the two. The material allows the bag to stand up straight while you’re packing, which is nice. There is still a mesh top to help with ventilation. The zippers are durable and strong. The compression works really well with these bags. They come in three different sizes with extra organization bags, as well. The sizes differ slightly, in that the large is the only bag that is 3 inches deep. The others are 2.5 and 2 inches tall. There is a lifetime warranty. As with many household basics, Amazon has created a product to rival the top brands. 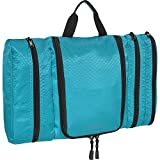 Now you can buy packing cubes by AmazonBasics. The basic design is the same, with stronger polyester material for the main body of the bag, with a breathable mesh top and double zipper pulls so you can zip and unzip in any direction you want. 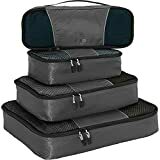 The Amazon packing cubes set includes four bags – small, medium, large and slim. The slim size is great for filling that edge of the suitcase that the other bags don’t fill. However, if you don’t like this configuration, they also have sets that just include one size, so you can buy one that fits your needs. They can be machine washed. As far as I can tell, they don’t come with a lifetime warranty, but Amazon always backs their products, so I’m sure they’d send out a new set if something went wrong. They’re a good option at a decent price. These Shacke Pak packing cubes have gained really high regard from travelers. They are made with high-quality water-resistent nylon material that will withstand the text of travel. The set comes with four pieces, including extra-large, large, medium and small, plus a bonus laundry bag. One of the challenges of a good packing cube is how well it compacts the clothing inside. A good packing cube will compress everything inside because it’s made of a strong, flexible material. So the space needed to contain the clothing is much less than if you weren’t using a cube. This Shacke Pak cube meets the challenge well. Each cube is 4 inches deep to hold a ton of clothing, and the double-stitched seams do a fantastic job of holding it all in. The basic packing cubes are fantastic, but there are a few other organizers that are made to go with the cubes. Portage Toiletry Kit. Both have hangers at the top so you can hang them up. But the Portage kit is more standard and fits larger bottles of products. Shoe Bag, which is more of a case style with a zipper, and won’t require you to squish your shoes into the bag. I use these for all our headphones and electronics cables, earplugs, eye masks, jewelry, makeup, busines cards etc. You name it. There are multiple squares in the pack, and they’re all different colors, so you can keep everything packed into different pouches. Then just grab the one we need. They’re small and can fit anywhere. Very convenient way to pack small items. One of the biggest challenges we have is separating our clean clothes from the dirty ones without creating space issues. It’s really not pleasant to have your dirty clothes stinking up your clean ones. The Eagle Creek clean/dirty packing cube solves that dilemma by providing a bag with two sides – one for clean and one for dirty. It’s keeps them completely separate, and they take up the same amount of room, either way. Sorta brilliant. There you have it, the best packing cubes on the market to make your packing life so much easier. All of these compression packing cube options will help you pack like a pro. They will soon be your favorite piece of luggage and the reason you don’t mind living out of a suitcase every now and then. I swear by them, and I can’t recommend them enough. Do yourself a favor and buy a couple different colored sets and just see how this changes your life. This entry was posted in Reviews and tagged packing. Ryan, you must get cubes immediately. They will solve all the jamming clothes into carry on situation immediately.